Is it already that time of year again? The time where we gather around as families, eat way too much & decorate for Christmas. I think that this year has probably been one of the fastest. The bottom line is though, I absolutely love this time of year. I look forward to it all year long. I even wrote this post on why you should treat every day like Christmas. I'm always ready for Christmas, but Thanksgiving is definitely one of my favorite holidays, if not my second favorite. I love the meaning behind it & the reminder that we should be thankful-- every day. I also love giving back. I clearly think you should always be giving throughout the year, but this is such a great time of year to give. It often seems as if there are so many more opportunities to give during this festive time. 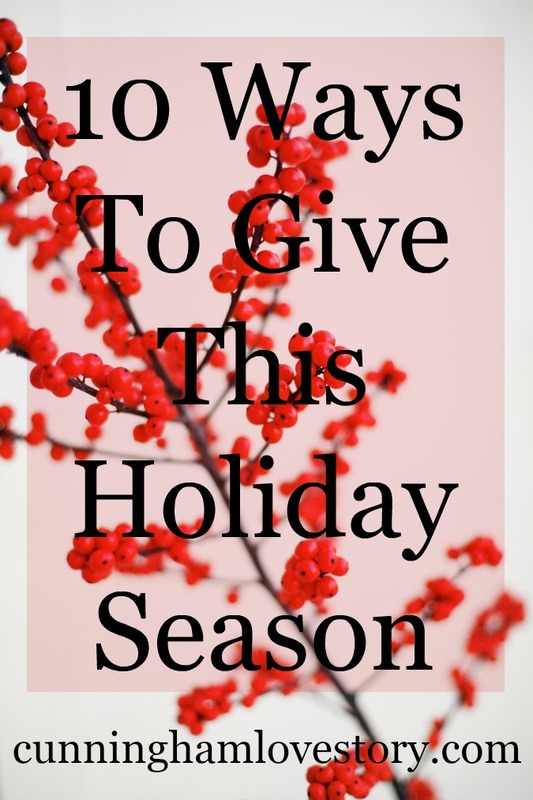 So here are 10 ways that YOU can give during this holiday season! 2. Pay for someone else's drink or meal behind you in the drive-thru line. 3. Take part in a gift-giving project for kids who often don't get any presents. 4. Make a meal for someone. 5. Be a "Secret Santa" to a family you know is struggling. 6. Place a gift card or money in an unexpected place such as a grocery store, gas pump, Redbox movie case, etc. 7. As a church, friend group, etc., do a service project for a place that helps people in your community. 8. Take (store bought) cookies, gifts, etc. to your local police officers & firefighters to thank them for helping keep your community safe. 9. Give a waiter or waitress who is having a rough night serving, an extra large tip for their hard work. 10. Run an errand for someone who isn't able to. What ways are you giving this holiday season? Love all of these! The holidays really can bring out the best in people when they focus on kindness! I love this list. I'm definitely going to tick some, if not all, off this list!